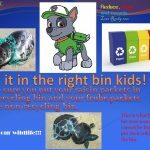 Recently, class 5L created new eco posters to put up around school. These were to replace and refresh the ones made from a previous year group. 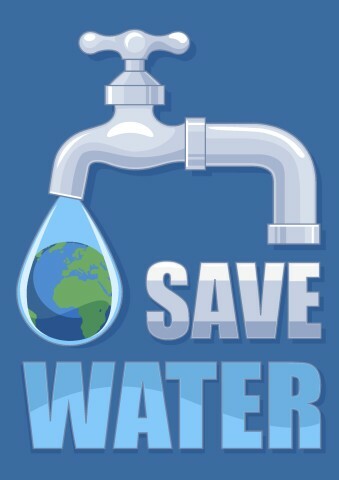 The children created posters to raise awareness on saving water, energy and to promote the importance of recycling. The posters should remind staff and children to switch electrical items off standby in their classrooms, as well as in shared spaces around school. Another message is to keep our grounds clean! 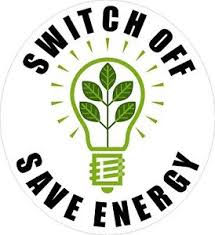 November is energy month which includes ‘Switch off fortnight’ and at Delapre we are celebrating the fact that we have saved energy over the last year compared to the year before. Kirsten Grundy from Northamptonshire County Council’s waste energy education team came into school and presented us with our Energy Display Certificate. This proves that we are using energy more efficiently in our school. Kirsten also led assemblies on saving energy for KS1 and KS2 which included what items use energy, easy tips to save energy and taking pledges from children on what they could help with. It is great to know our efforts are paying off! Over the past year, children have been reminding each other (and staff!) to switch off electrical items, especially off standby. 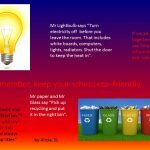 Last year our year 5 ‘Eco-warriors’ produced posters and gave talks about reducing energy, they have had an impact it seems. 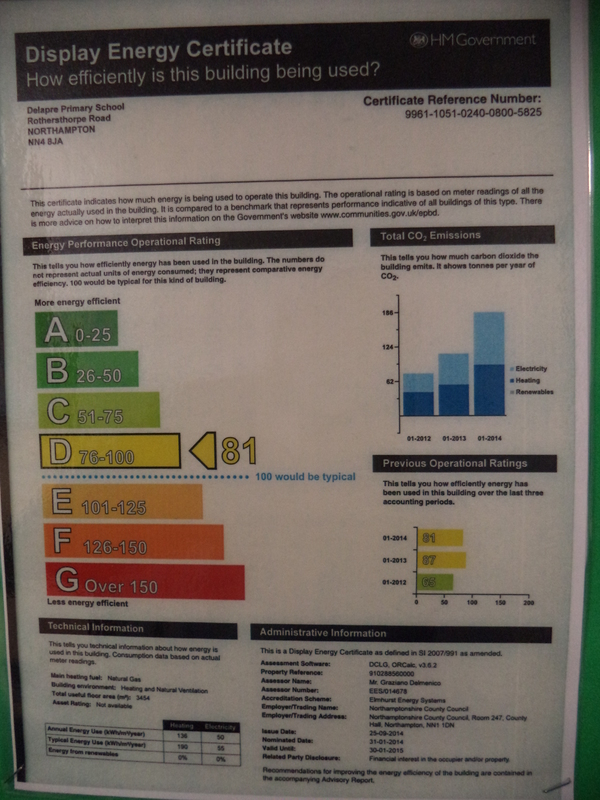 We have also just completed our second energy survey on classrooms around the school to see where energy is being wasted and enable us to make changes for the better. Fortunately this has also improved. Well done to all the staff and children, working together we can help to save the planet a little at a time! 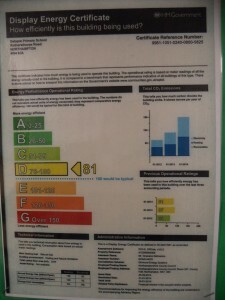 When I did the energy survey around school I found out that the worst eco saver was 4f. The best class in the school was 4b there was no one in the room but all the lights were off there were no drafts, that is being a Eco saver! I think 4f should save more…..
On a day me and my friends went spying in the teachers rooms. My friend and I found out that teachers were really bad at saving electricity. The worst was our old class 4F. All the lights, radiators and computers were on when the room was empty. My new class is so much better at saving electricity and that class is 5L. Me and Macie in a pair walked around the school checking if all the classes were being Eco! We checked if the lights are off if no one was there, if the radiators are on when the windows were open, if the windows have holes on the side that let out warm air. We also checked if the computers were on if no one was using them. Most classes were fine but some weren’t as Eco as others, mostly when it came to radiators being left on. 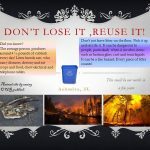 In our class we have been learning how to be eco friendly and save the environment.We have split into different groups to look around the school and find out if they are eco or not.In my group me and Matylda looked in years 5 and 6 to see if they use a lot of energy.We found out in some classes they used less at night and more at lunchtime. This week we have been doing about how to be an eco school. This video has some examples of some ways to save energy. We are learning to be ECO WARRIORS! I am in the energy group. We go round the school and look at peoples classroom and we look at the windows the radiators and the most important one LIGHTS!. On Tuesday me and Charlie, Conner,Macie,Jacob,Matylda stayed after school and helped Miss Letts go around classrooms to find out about energy being wasted. Me and Jacob went to year1 and year2 then Mrs Arnold gave us a chocolate hobnob.